Father, help us to live as the Holy Family, united in respect and love. Bring us to the joy and peace of your eternal home. Grant this through our Lord Jesus Christ, your Son, who lives and reigns with you and the Holy Spirit, one God, for ever and ever. Amen. Scripture tells us practically nothing about the first years and the boyhood of the Child Jesus. All we know are the facts of the sojourn in Egypt, the return to Nazareth, and the incidents that occurred when the twelve-year-old boy accompanied his parents to Jerusalem. In her liturgy the Church hurries over this period of Christ's life with equal brevity. The general breakdown of the family, however, at the end of the past century and at the beginning of our own, prompted the popes, especially the far-sighted Leo XIII, to promote the observance of this feast with the hope that it might instill into Christian families something of the faithful love and the devoted attachment that characterize the family of Nazareth. The primary purpose of the Church in instituting and promoting this feast is to present the Holy Family as the model and exemplar of all Christian families. — Excerpted from With Christ Through the Year, Rev. Bernard Strasser, O.S.B. Marriage is too often conceived as the sacrament which unites a man and a woman to form a couple. In reality, marriage establishes a family, and its purpose is to increase the number of the elect, through the bodily and spiritual fecundity of the Christian spouses. 1. Every marriage intends children. Although Mary and Joseph were not united in a carnal way, their marriage is a true marriage: an indissoluble, exclusive union, wholly subordinated to the child. Mary and Joseph are united only in order to bring Jesus into the world, to protect and raise him. They have only one child, but he contains the whole of mankind, even as Isaac, an only child, fulfilled the promise made to Abraham of a countless progeny. 2. The purpose of every marriage is to establish a Christian family. The Holy Family observed the religious laws of Israel; it went in pilgrimage to Jerusalem every year with other Jewish families (Lk. 2:41). Jesus saddens and amazes his father and his mother because to their will and company he prefers "to be in his Father's house". Thus it may happen that God's will obliges the family to make disconcerting sacrifices. Yet every Christian family must live in harmony and in prayer, which are the pledges of joy and union. 3. "He remained obedient to them." Jesus was God. And through the fullness of grace Mary stood above Joseph. Nevertheless — if we except the event in the Temple — Joseph remained the head of the family; he took the initiative (as when the Holy Family fled to Egypt), and in Nazareth Jesus obeyed his parents. 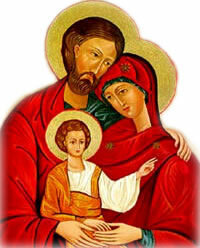 The devotion to the Holy Family was born in Bethlehem, together with the Baby Jesus. The shepherds went to adore the Child and, at the same time, they gave honor to His family. Later, in a similar way, the three wise men came from the East to adore and give honor to the newborn King with gifts of gold, frankincense, and myrrh that would be safeguarded by His family. We can go further to affirm that in a certain sense Christ, Himself, was the first devotee of His family. He showed His devotion to His mother and foster father by submitting Himself, with infinite humility, to the duty of filial obedience towards them. This is what St Bernard of Clairvaux said in this regard, ‘God, to whom angels submit themselves and who principalities and powers obey, was subject to Mary; and not only to Mary but Joseph also for Mary’s sake [….]. God obeyed a human creature; this is humility without precedent. A human creature commands God; it is sublime beyond measure.’ (First Homily on the ‘Missus Est’). Almost intuitively, one can recognize that the mysterious, exemplary, guardianship enacted by Joseph was conducted firstly, in a yet more intimate way, by Mary. Consequently, the liturgical feast of the Holy Family speaks to us of the fond and loving care that we must render to the Body of Christ. We can understand this in a mystical sense, as guardians of the Church, and also in the Eucharistic sense. Mary and Joseph took great care of Jesus’ physical body. Following their example, we can and must take great care of His Mystical Body, the Church, and the Eucharist which He has entrusted to us. If Mary was, in some way, ‘the first tabernacle in history’ (John Paul II Ecclesia de Eucharistia, n. 55) then we the Tabernacle in which Our Lord chose to reside in person, in His Real Presence, was also entrusted to us. We can learn from Mary and Joseph! What would they ever have overlooked in the care of Jesus’ physical body? Is there something, therefore, that we can withhold for the right and adoring care of His Eucharistic Body? No amount of attention, no sane act of love and adoring respect will ever be too much! On the contrary, our adoration and respect will always be inferior to the great gift that comes to us in the Holy Eucharist. Looking at the Holy Family, we see the love, the protection, and the diligent care that they gave to the Redeemer. We can not fail to feel uneasiness, perhaps a shameful thought, for the times in which we have not rendered the appropriate care and attention to the Blessed Eucharist. We can only ask for forgiveness and do penance for all the sacrilegious acts and the lack of respect that are committed in front of the Blessed Eucharist. We can only ask the Lord, through the intersession of the Holy Family of Nazareth, for a greater love for their Son Incarnate, who has decided to remain here on earth with us every day until the end of time. Let us imitate the Holy Family in our Christian families, and our family will be a cell and a prefiguration of the heavenly family. Say a prayer dedicating your family to the Holy Family. Also pray for all families and for our country to uphold the sanctity of the marriage bond which is under attack. Read more about Pope Leo XIII who instituted the Feast of the Holy Family and read his encyclical On Christian Marriage. You can also check out the Vatican's page of Papal documents on the Family. Read the explanation of Jesus' knowledge in the activities section. Read Pope Pius X's Syllabus of Errors which condemns the modernist assertion that Christ did not always possess the consciousness of His Messianic dignity. Have the whole family participate in cooking dinner. You might try a Lebanese meal. Some suggestions: stuffed grape leaves, stuffed cabbage rolls, lentils and rice, spinach and meat pies, chicken and dumplings, hummus, Lebanese bread, tabbouleh — a Lebanese salad and kibbi, a traditional Lebanese dish of specially ground meat mixed with spices and cracked wheat. This is the same kind of food that Mary served Jesus and St. Joseph. It's healthy and delicious.